Let’s recycle! 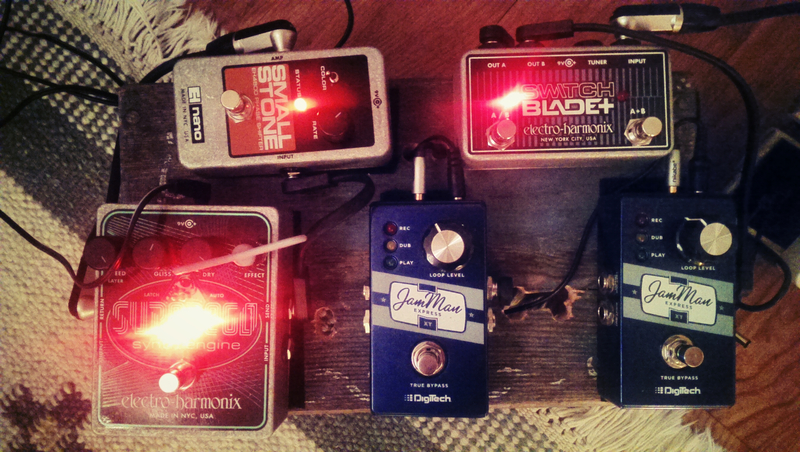 I realized that I needed a pedal board and started looking around the web. Most of the commercially available ones where made from metal, and I figured I wanted something that resonates with the instruments that I play – wooden and with a history. Anyway, how hard can it be to make your own, right? 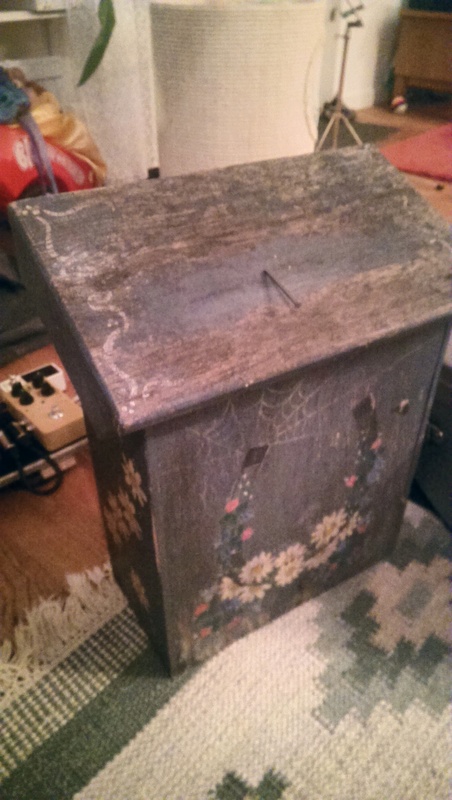 Here’s how I made two DIY makeshift pedal boards out of an old swing and a mailbox. First, the old swing. 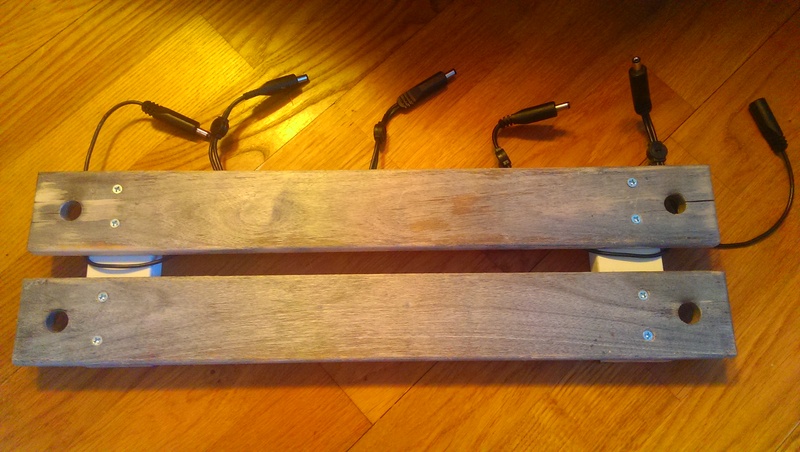 Basically it was just two wooden planks with beautiful patina that I figured would be perfect to hold four-five pedals, which is what I use in most live situations. 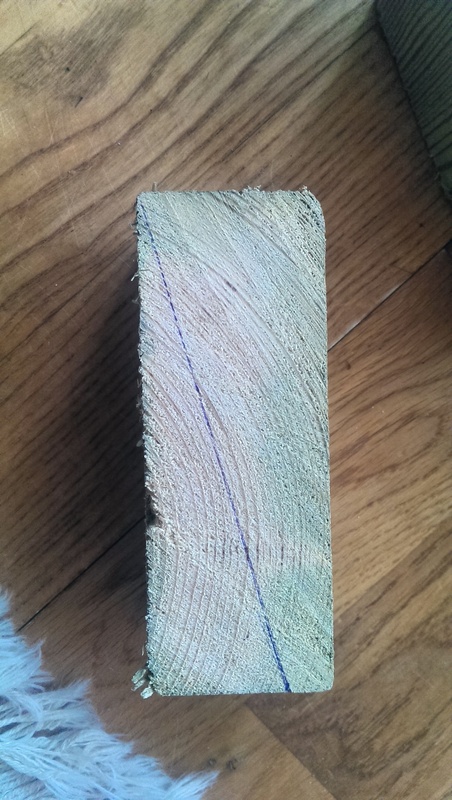 So I basically just sawed two 1 decimeter “feet” from another plank and screwed them to the bottom of the planks. 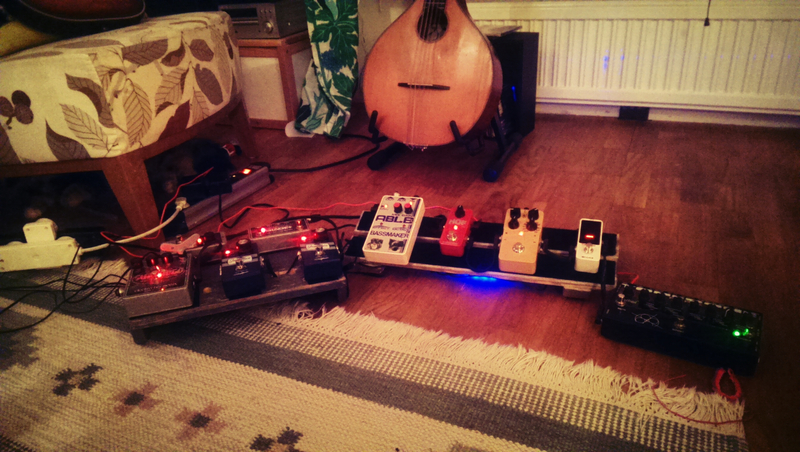 I didn’t have a power bank at that time, so I took the daisy chain cable and attached it to the pedal board with nails. 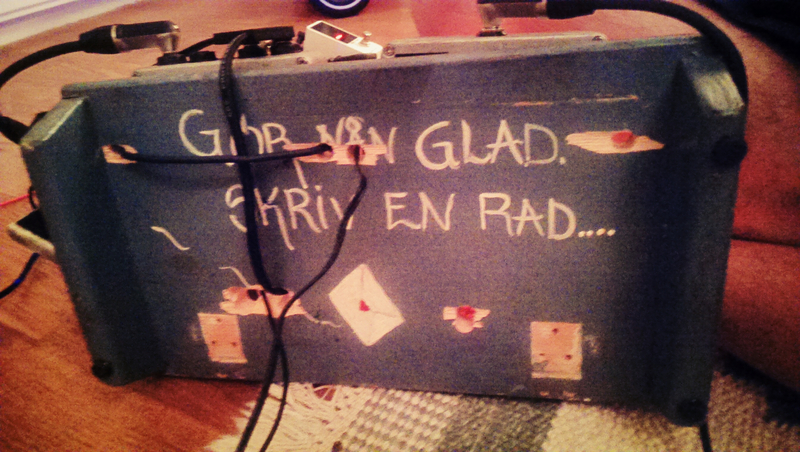 While I really liked my new pedal board the daisy chain thing wasn’t that great – I got an annoying hum from my reverb pedal when it was in the chain so I always needed to have extra power anyway so that meant lots of cables and the initial niftyness of my pedal board was a bit ruined. 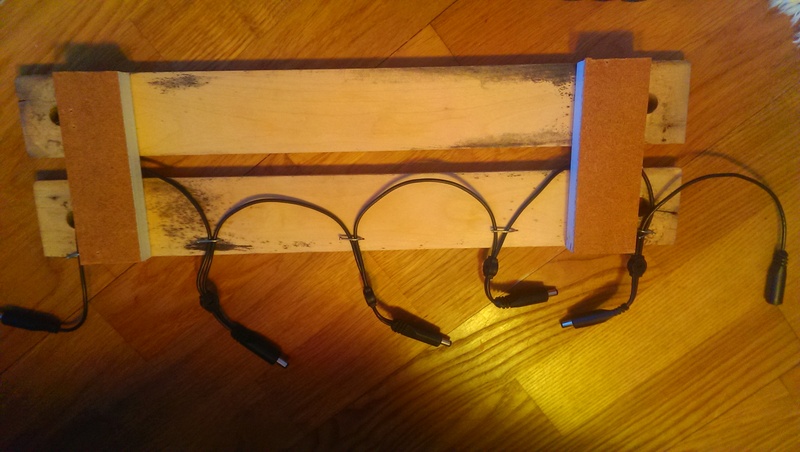 I needed a power bank – but how would it fit on, or preferably below, the board? I heard of “Micro Mooer Power“, the tiny power bank from developers Mooer Audio. 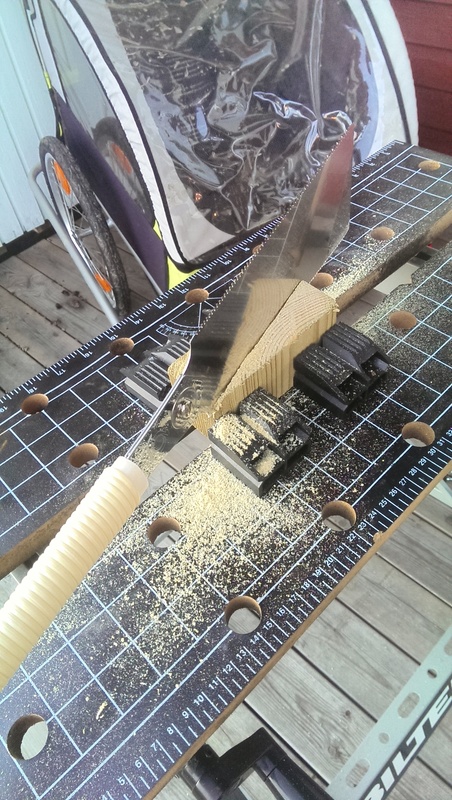 It was small enought to almost go under my board, but I would need to raise it a little bit to make it fit. Instead of raising the height of the whole board I decided to change the feet so it would tilt up a bit. That would also make it easer to reach the pedals. 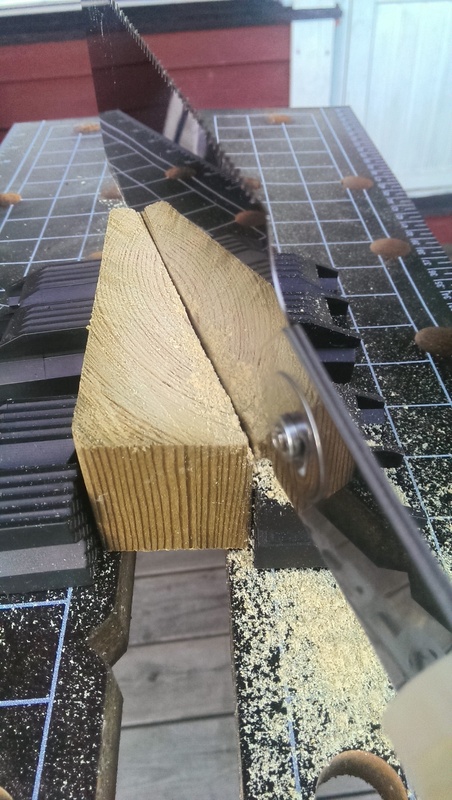 Sawing the tilted feet was harder then expected, but with help from Facebook, a Japanese dozuki saw, my 8-year of son and a long plank that allowed for me to fail a few times it finally worked out pretty well. 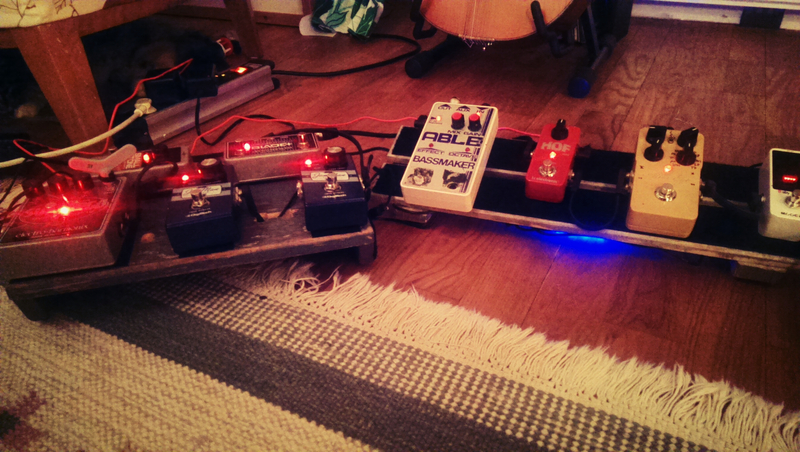 I screwed the feet to my board, got the Mooer Micro Power and attached it with velcro to the bottom. 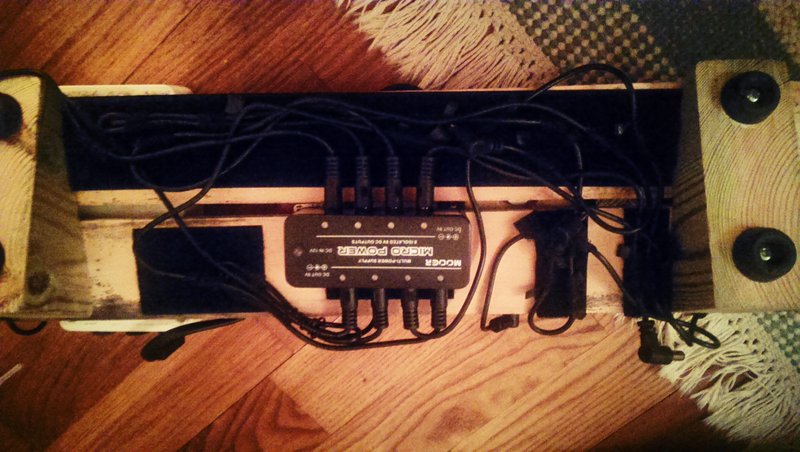 I also attached velcro to several spots on each cable, which allowed me to tuck them away neatly underneath the board (as neat as it can get with 8 long cables coming out from the power bank like a weird electronic octopus). Niftyness restored! 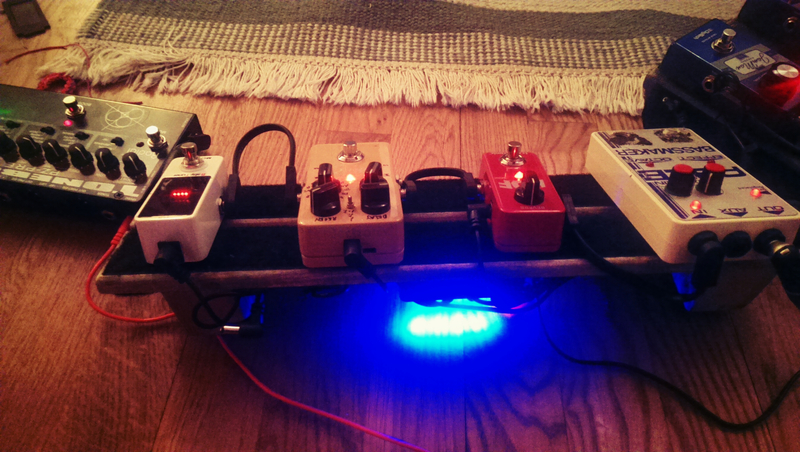 Alright – brand new-old tilted swinging pedal board ready! 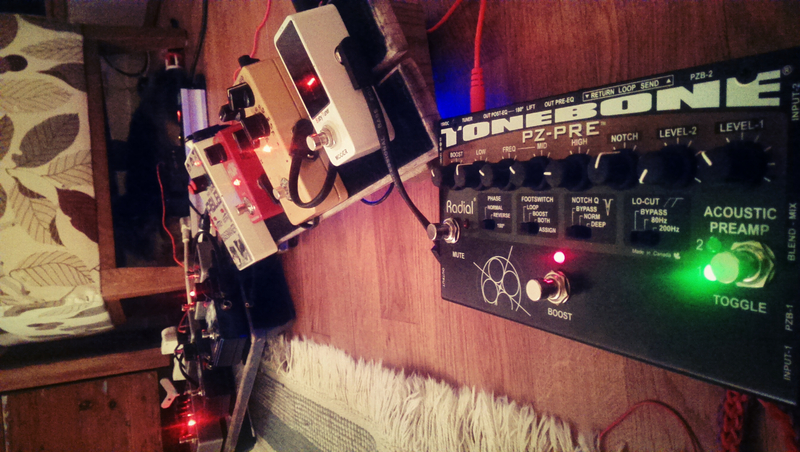 But at this time I had started using a few more pedals – specifically two Digitech JamMan Express XT loopers, which (1) wouldn’t fit on the board and (2) didn’t seem to play well with the Mooer Micro Power, since I got a high pitched hiss coming from them when connected to the miniature power bank. I have not yet had the possibility to experiment with other power banks, so I am uncertain if this is a case of the pedals being super picky about having their own personal power adapter or if it could be solved with a more expensive/bigger power bank. 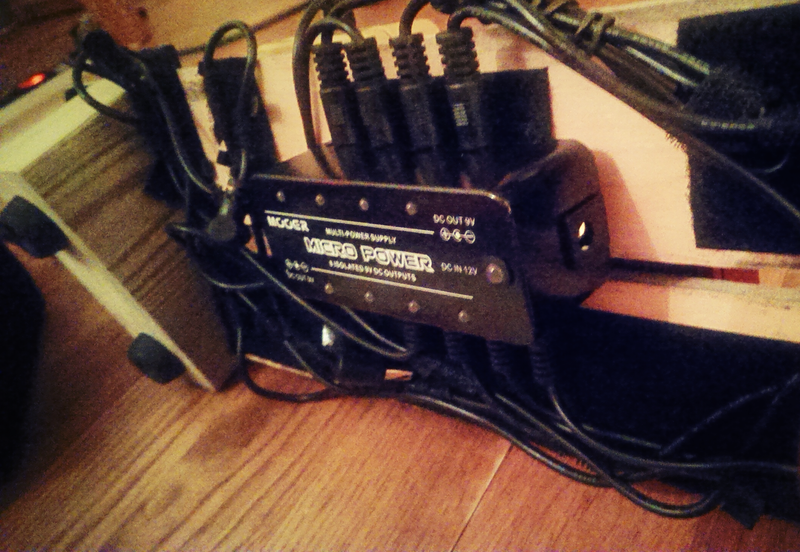 Please let me know if you have tried the JamMan XT loopers with power banks and if it works? 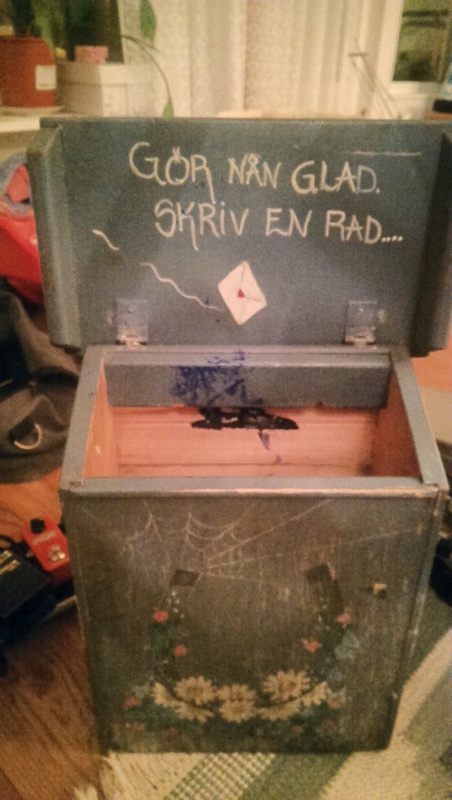 So I loosened the lid, sanded it down a bit and drilled holes on strategic places to draw the cables through (I know it looks like crap from underneath, but who’s looking there?). Then I attached velcro (yay!) and that was basically it! It would probably look more professional if I’d sand away all the paint from it, but I kind of like that you can actually still see what it used to be. Thanks for reading, let me know if you have any questions or comments! …is the accurate phrase around these parts, I believe. Or perhaps I should say welcome, but on the other hand we all just got here. Before we get into the gear-goodness I want to tell you why I started this blog. I’m a musician in the folk/world genres and play all sorts of plucked acoustic instrument. My main instrument is a lute called mandora and a flatback nordic mandola. I also play other weird instruments that no-one has ever heard of such as a mora-oud and willow flute, as well as acoustic steel stringed and classical guitars. The thing is, I have a background as a metal guitarist and have always liked the idea of pedals and effects even though I didn’t use any at all for many years when I got into acoustic music. Lately I’ve been getting a lot of different pedals, and every time I’m researching one I notice that NO ONE ON THE INTERNET REVIEWS THESE PEDALS WITH ACOUSTIC INSTRUMENTS! There are like a hundred youtube-demos with generic metal guitarists pairing that sweet reverb-pedal that I want with a MT-2, but not a single one using it with a steel-stringed acoustic. So how about we change that. Here, I will make reviews and demos of guitar pedals, effect boxes and accessories using only different acoustic instruments. It will usually be gear that probably was designed with electronic instruments in mind, but I will also occasionally review stuff that is made for acoustic instruments as well as showing of my instruments. Stay tuned for acoustic demos of: Electro Harmonix Superego and EHX Nano Small Stone, TC Electronic Ditto X2, TC Electronic Flashback Delay and TC Electronic Hall of Fame mini, Boss OC-3, Able Bassmaker, Radial Engineering Tonebone PX-Pre, Mooer Solo and Mooer Baby Tuner, Line 6 Amplify TT. For starters.